The Elly books, by Jon Higham, are getting a makeover, starting with book one! Each title will now have the lovely narration of Rose Higham, "a drama student and the author’s niece." The text doesn't highlight as read, but it is otherwise perfect now for pre-readers. Elly the Reindeer is a cute cartoon-style reindeer. She has adventures with her animal friends in a sweet rural setting where all the child-like characters live in their own homes (by themselves) and look to each other for help, fun and solving the occasional dilemma. 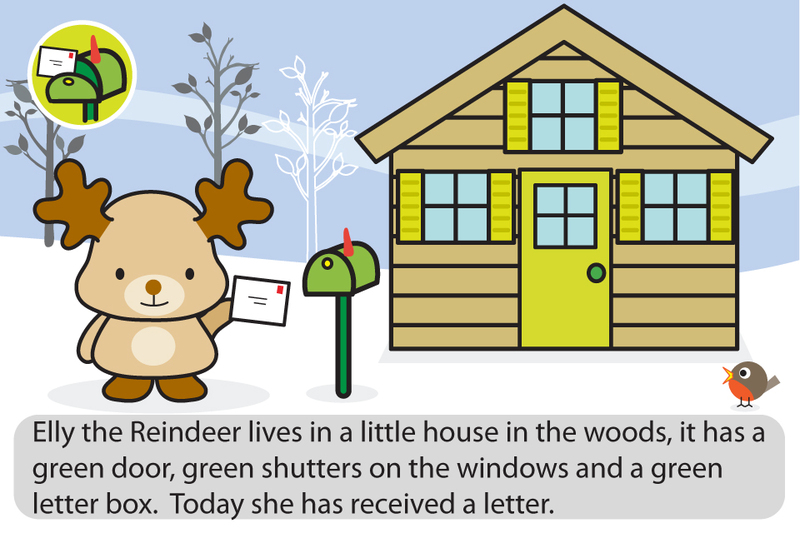 In this story there is a mysterious letter in Elly's mailbox. It says "You are invited to a birthday party tomorrow at 11:00am." Unfortunately there is no information in the letter to tell her where the party is or who it is for. Elly goes from friend to friend asking if they know about the birthday party. Each of them tells her they can't help her. She decides to bake a cake just in case someone tells her at the last minute about the party details. The next day she is waiting at home and a knock on the door comes at exactly 11am. When she answers the door, she finds all of her friends, saying "Happy Birthday". Elly realizes she has forgotten her own birthday! Then all the friends eat cake and Elly says she is going to write her birthday on the calendar so next year she can send the invitations herself. This cute series of books has become a fast favorite of my preschooler at bedtime. They are short and sweet, perfect for reading before bed. They are also simple enough for young children to read to themselves. This book series also has a very small interactive element, featuring a single sound on about half the pages. This sound effect is tied to the text on the page, like a knock on a door. It is triggered by tapping in a small circled image that corresponds with the sound. It is a nice little extra, but nothing to distract too much from the story or overstimulate a child at bedtime. Overall, this is a cute book in a series featuring child-like animal friends that exemplify positive pro-social behavior toward each other. The Elly books are delightful and engaging for young readers and listeners. Enjoy the cute adventures of Elly & her friends, now with narration! In this ebook, the first in the Elly the Reindeer books, Elly gets a letter inviting her to a birthday party but there is no location or info about who the party is for. She goes to her friends one by one and asks, "do you know anything about a birthday party tomorrow? "Her friends claim they cannot help her. Once the day is over, she decides she will bake a cake just in case she can find out more about the party. She gets a surprise knock at the door at 11am sharp. Her friends are all there, saying "Happy Birthday!" She has forgotten her birthday ... but thankfully her friends remembered and were all there to celebrate and share the extra large cake she has baked.